Do you feel powerless in light of news media reports about ISIS terrorism coming to our shores? Are you afraid that you, your children, family or community could be next? What do you need most to feel safe, united, unafraid? Fear-mongering appears to be the bomb that news media outlets use to make sure they attract more viewers, page likes, user engagement, etc., so that they can point to stats that will bring in more advertising revenue, which is what allows them to stay in business, right? Apparently, the theory is that if enough people can be aroused by a sense of fear (or outrage) they will keep coming back to the BIG BOLD NEWS HEADLINES that mostly call attention to the worst of what goes on in the world, but rarely the good. Have you ever noticed that the good news is kept at a minimum? And at best, it might show up in a news feed every once in awhile? But rarely in BIG BOLD HEADLINES? Maybe the media business knows that if they saturate you with too much of the bad, you will lose heart and never come back at all. Actually, behavioral science drives that very strategy. As reported in Psychology Today, it has to do with our preferences for wanting to know about bad things that might threaten us (hearkening back to our hunter-gatherer instincts) rather than good news that gives us a sense of hope for the future. Interestingly, however, according to Susan Krouse Whitbourne, PhD, who states that even though “The media thrives on stories of death, destruction of property, a plummeting economy, or other calamitous events,” most of us would rather be people who bring good news to others. And that is why we are attracted by stories about people like Malala Yousafzai, the young Pakistani girl who nearly lost her life speaking out about female education under the rule of the Taliban, but later became a Nobel Peace Prize winner; or stories about The Great Generation and the unity of purpose and resolve they demonstrated during WWII; or even timeless fictional stories by Dickens, Jane Austen, Ian McEwen, Lucy Maud Montgomery, or characters like Hermione Granger, Jane Eyre, George Bailey, Rocky, Supergirl, BatWoman, and the like. 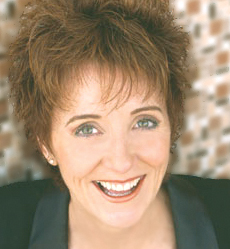 History tells us that especially in times of civil unrest, economic uncertainty, global upheaval, barbaric killings, suppression of truth (in short, anything that threatens the core need for freedom of the human spirit), we all want and need true stories or fictional stories that inspire the kind of courage, hope and fearless moxie that ignites the power of heroic love. And we want them in BIG BOLD HEADLINES. 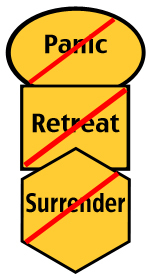 That is why the Judah and Tamar Trilogy (based on Genesis 38) continues to urge us on in the telling of what we call the GREATEST LOVE STORY NEVER TOLD, keeps us ever vigilant in making sure that we contribute to good news that will help you reinforce your core values and stand united in the belief that by saying “NO!” to panic and retreat, and by never surrendering to fear or fear mongering you will find brilliant ways to keep yourself, your loved ones and your communities strong and unafraid. Q: How long can you live without water? A: 3 days, in extreme exceptions, maybe up to 7-10 days. Q: Could severe drought lead to severe conflicts, especially in the Middle East? A: Our research for the Judah and Tamar Trilogy (an heroic love story based on Genesis 38) reveals that drought drove people south during the Middle Bronze Era, and that other related political upheaval (Hyksos invaders) threatened peace, even as peace is almost non-existent there today. It seems no coincidence that water rights may be even more important than oil rights. After all, you can’t drink petroleum oil, can you? History teaches us that love always wins in the end. Sometimes in the most unlikely ways. Take Judah and Tamar, for instance. They are probably the most controversial couple in the Bible, and the circumstances of their particular kind of love shocks most people, offends many others, and, at best, confuses the meadow muffins out of everyone else. After all, Tamar seduced her father-in-law and out of their bloodline came King David and his lineage. But our account of the story in the 1st book in the Judah and Tamar Trilogy, Tamar of the Terebinths, sets the stage for the greatest love story never told. This heroic love emerges during an era of drought, war, and fear. Sound familiar to today’s realities in the Middle East? It would be impossible to put into numbers the amount of time we have spent researching this story in order to find authentic ways to dig down into the historical realities of the time period in which their union unfolded. But one thing we do know is this: in spite of all the odds against them, no matter how difficult things got for them (including Hyksos raids, drought, being shunned by society), these two characters managed to find a way to pull their act together to form a royal bloodline. Neither the lack of water nor the lack of tribal compassion stopped them from doing what was right for the times and culture in which they lived. Today, they might never make it out of the drought alive. Today, they might have to live on the run to avoid being killed for their love. Today, they might never leave behind a story and lesson for our own times. Q: Do you like this idea of a heroic love story that started in the Middle East? A: If so, the answer that makes everyone happy is Like our Facebook page and stay engaged in the conversation. We are pleased to announce the 1st draft of the Judah and Tamar Trilogy Book Two was completed in mid-April, and that the 1st two chapters have been edited and are currently being read by our readers. The cover design for Judah of the Terebinths, which is the title of Book Two in the Judah and Tamar Trilogy, is currently in the hands of our talented artist, Rona Liu, who graciously designed the cover for Tamar of the Terebinths, Book One in the Judah and Tamar Trilogy. We are currently looking for two more readers, so if you are a literary person and enjoy reading new manuscripts for typos, story structure, character and plot development, grammar, and punctuation, contact us. Of course, it helps if you have already read Tamar of the Terebinths so that you will have a sense of context and continuity that threads its way through the Tamar of the Terebinths. If you are unfamiliar with this story that hails from the Genesis 38 account of how one of the cornerstone characters in Biblical and Middle East history became the ancestor of kings, find out more about the what we call THE GREATEST LOVE STORY NEVER TOLD. We are busily researching, writing and editing Book Two in the Judah and Tamar Trilogy: Judah of the Terebinths. We are also creating maps for the Judah and Tamar story and hope to include one or two of them in Judah of the Terebinths. 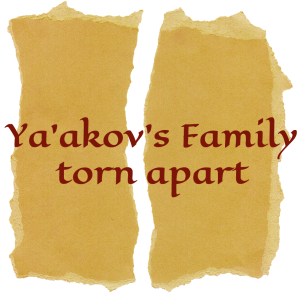 Since Book One of the Judah and Tamar Trilogy was written from Tamar’s viewpoint (1st person present tense), Book Two is being written from Judah’s viewpoint. Book Three, Song of the Terebinths, will be written from both of their viewpoints. Right now we are calling our approach “coism,” which is to say that we believe there needs to be a co-equal perspective for this story, not just a female perspective or a male perspective separate from the other. We think that the balance between the two perspectives is not only an interesting way to write the Judah and Tamar story itself, but is also an interesting way to write a trilogy. 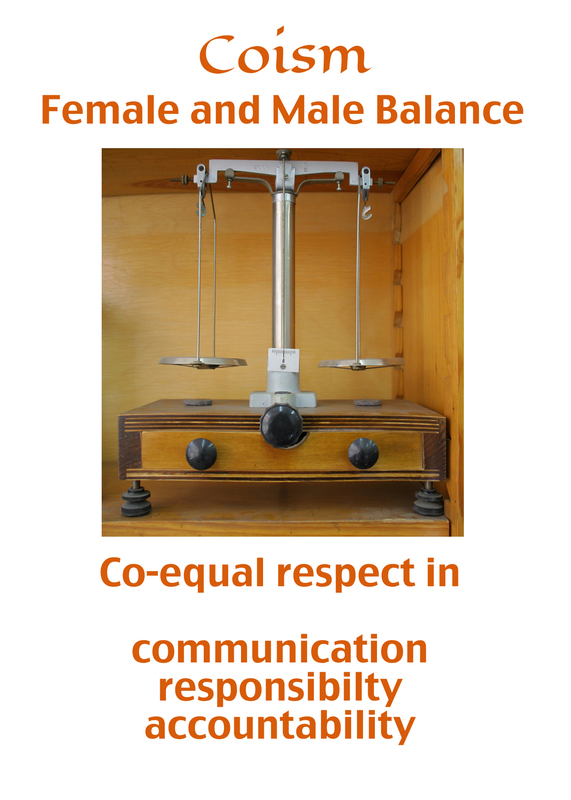 We also think that the concept of coism encapsulates the next step that needs to be taken in order for societies to achieve true balance between female and male communication patterns, which can ultimately lead to more actualized peace in the world. Our collaborative process with this story has allowed us both to realize that we are being required to grow in our individual personal lives even as this story grows. We are being required to set aside old and tired communication patterns that do not produce harmony or strength. We are being required to learn what it means to successfully apply the concepts of coism in the real world outside of the fictional world of the Judah and Tamar story itself. With these things in mind, we continue to bring you the best possible ideas that we can create. Ideas about coism in communication between female and male patterns, coism between different people groups, coism between family and community members. It is our hope that you will also consider coism in light of your own life and relationships. Meanwhile, back to writing, and if you haven’t read Book One of the trilogy yet, get it here. I am please to announce that Michael and I have been invited by Los Angeles author, Eduardo Santiago, to be part of the Idyllwild Author Series 2014. We will be interviewed by Eduardo on June 29th at Cafe Aroma. More details to follow once we have more information. Oh, and here’s our new header, soon to be part of the site. This is a quick post to let you know that our site will be undergoing some cosmetic changes in the next few weeks…a few new colors, images and videos to perk up Judah and Tamar and their public image. Not that they personally need it. But then again, these two characters have a pretty racy background according to some Biblical scholars. Lots of controversy, to be sure, but that makes for a good story, don’t you think? Anyhow…new stuff happening at Judah and Tamar. I’m excited to announce that Michael Silversher (click his name to see a little of his bio at the bottom of the Authors’ Page), my co-writer for The Judah and Tamar Trilogy, will be able to join me in Idyllwild to speak about the first book in the trilogy, Tamar of the Terebinths. 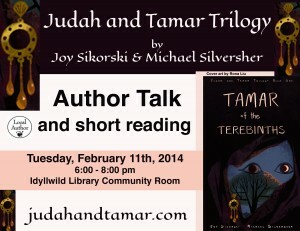 On Tuesday, February 11, 2014, we will be speaking at the Idyllwild Library in Idyllwild, CA about Tamar of the Terebinths, Book One in The Judah and Tamar Trilogy. I will be doing a short reading from Tamar of the Terebinths and we will both be talking about the inspiration for The Judah and Tamar Trilogy, how the first book emerged after another one was tossed out during the publishing process and what will be coming up next with this project. 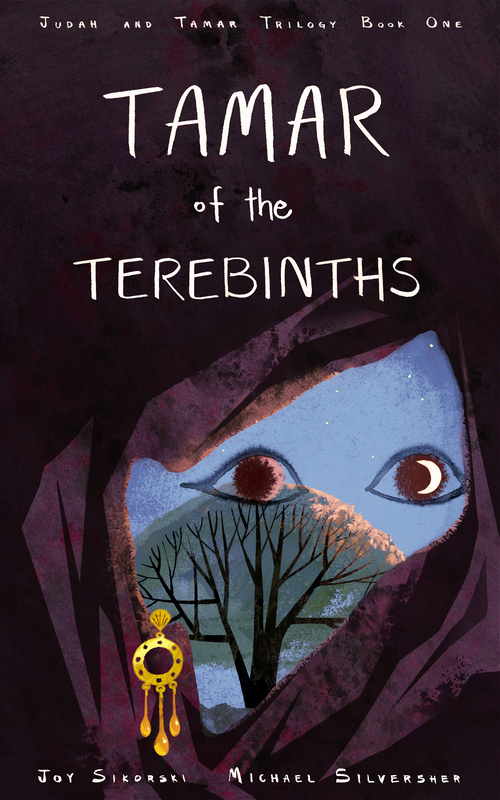 If you like historical fiction told in an unusual manner, you will want to join us at the Idyllwild Library on February 11th from 6 – 8 pm for a exciting evening with the authors of Tamar of the Terebinths! Yay! 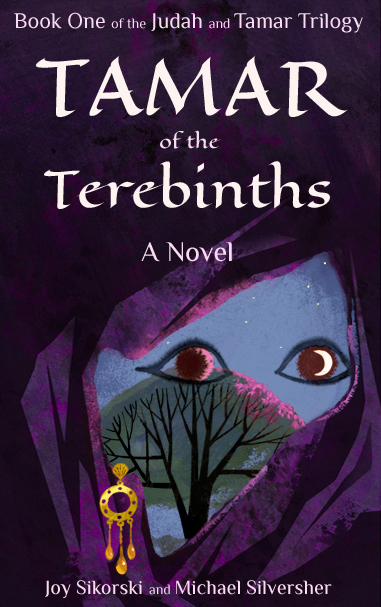 Tamar of the Terebinths on Amazon! We have an incredible story to tell you about how this particular book was written, but before we get around to doing that (in a future post), let’s just say that it was an impossible whirlwind of effort, perseverance and believing in the importance of integrity. Without you out there waiting for our promise to deliver the first book before the Fall of 2013 ended, this book would not have been written, believe me. More to come about that but not today. Today we celebrate the publication of the first book in the Judah and Tamar Trilogy. It is called Tamar of the Terebinths and trust me, it’s a doozy. When the research we discovered about the ties between religion and state showed up while it was being written, it walloped the daylights out of the direction we had taken and got us on track to tell the story that was crying out to be heard. This allowed us to better speak for Tamar and the women of Sh’chem and give Judah a more realistic and sympathetic heart attitude to the women in his life so that he could hear their life-changing voices more deeply. Do you like intrigue and unexpected twists and turns in historical fiction? Then Tamar of the Terebinths is for you! Wow! Revision two of the Judah and Tamar story, Song of the Terebinths, is done! It has been a long haul to get this far, but the difficulties of making major revisions to a story are worth the effort. At the end of the process, revision after revision means that the plot, the tension and release, depth of the characters and the grammar will be such that the reader will have the best possible experience. Collaborations can be like that, for if you put one person in the room, there are at least 10 different opinions and ideas. But, when you put two people in the room, the number of opinions and ideas increases exponentially! Yet, here we are, nearing the end of the long journey to get Book One of the Judah and Tamar story trilogy out to you, the readers. We are excited and eager for you to enjoy the next part of the journey with us. Some of you will have the revision in front of your eyes soon. That’s because our own eyes are getting somewhat burned out. So we will rely on you to help us see things that we can’t see at this point. The rest of you will have to wait until the publication date in the Fall of 2013 (exact date TBA). Meanwhile, we, the authors, will do our very best to bring you a really great story, written to the best of our combined abilities and the suggestions of those who help us in this last leg of the first leg of the journey. Remember, there are still two more books to go in the Judah and Tamar story trilogy! As I look back at the journey I have been on with my co-writer, Michael Silversher, it amazes me how the Judah and Tamar Trilogy got started, how it survived many roadblocks and how the two of us have managed to get as far as we have. You see, we are both primarily composers, singer-songwriters, performers. You know, that sort of thing. And although I am a published author (you can see more about both of us on the authors’ page), this is the first novel I have worked on and the first book writing collaboration I have worked on.